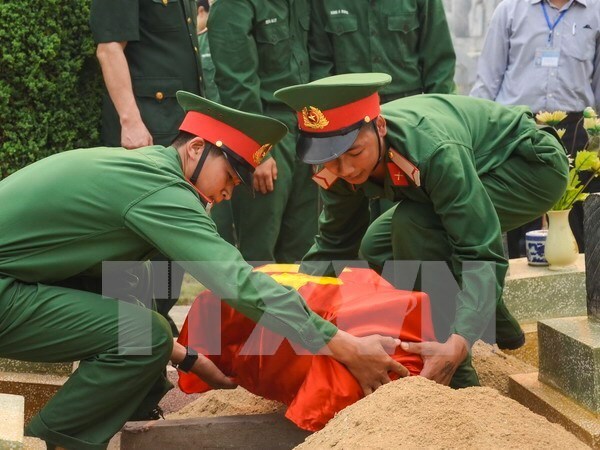 Thua Thien-Hue (VNA) – A reburial ceremony was held in a cemetery in Hue city of central Thua Thien-Hue province on May 13 for the remains of 15 Vietnamese volunteer soldiers and experts who died in Laos during wartime. The remains were found by Team 192 of the province’s Military Command from 2015-2016 in Laos’ Salavan and Sekong provinces. Speaking at the ceremony, leaders of the province highlighted the great services of the martyrs, who sacrificed their lives for the liberation of Laos, affirming that the sacrifice reflects the special friendship between the two Parties, Governments and people. Local authorities took the occasion to call for support from the two Lao provinces in providing information on the location of remains, and in searching and collecting the remains of Vietnamese martyrs.